i haven't got the rule book yet, waiting on the small one via E-bay. but was told that objective points are calculated at the end of each turn now. In a 5 objective game, unless we're playing an equally fast opponent we should be able to grab 10 objective points by turn 2. making it much harder for the enemy to catch up. If you're using the new Maelstrom of War missions then you get 3 Tactical Objectives each turn that may or may not involve securing an objective--there's a D66 table. Ive read my new books through a few times and played a few games now. The rules are basically cleaned up 6th with some needed tweaks. And a busted psyker phase. Deployment is now better though.. Randomly determine mission. Place terrain. Place objectives (except emperors will and relic). Roll for deployment map. THEN roll table sides. Then roll for 1st deployment. The player that wins the roll chooses to deploy first or second. The player that deploys first then chooses to go first or second. Much better IMO. Are formations officially a part of 7th? i.e. if i show up at LGS or even at a tournament, and I'm playing the Carnival of Pain formation from Apoc, do I get the bonuses for that formation? Apoc formation are still apoc only. It says all vehicles now have WS 1 so does that mean we now have to roll to hit with our wyches against a Land Raider which hasn't moved? Am I right in thinking that you're just as likely to Fast-Skimmer (so hovering above the ground) which turbo-boosted (moved extremely fast) is just as easy to hit in CC than a giant, static, grounded Land Raider? Please tell me I have misread! It's not that bad. Our Wyches actually got better. Charge a vehicle, if there are 2 close ones then disorderly charge both. Then proceed to throw 10 haywire grenades. We hit on 3+, so 2/3's of them hit. Now that leaves 6-7 hits. 5/6 of them glance which is up to 6 glances, killing one if not both vehicles. Plus now in close combat penetrating hits take away 2 hull points, making us even more brutal. We now don't have to worry about the vehicle exploding on us since we can't roll a 7+. And finally if we assault into an actual unit we can take defensive grenades that now blind. Making WS1 for the whole unit, which means we will most likely win any close combat where we hit with a defensive grenade in the shooting phase. TL;DR Wyches may be now be one of our best units. "A fall from that height would kill anyone — before they struck the ground!" Ah okay, thanks! I still find it silly that models can hit our skinny super fast vehicles just as easy as large static ones though. So i can take Dark olympyad only as unbound army? As much as it nerfs us, I can't help but think the thing about templates and open vehicles was coming. Where exactly would you hide from a spray of burning liquid on a flying skateboard? If you're talking about being able to assault out of WWPs, I wouldn't get your hopes up. Nothing else can assault from reserves and, if there was going to be an exception to that, I doubt it would be in a xeno book. To me it looks like GW has a very firm rule that nothing gets to assault without having at least one round of shooting + overwatch against it. Don't hold your breath for assault from WWP! In some ways webway portals got better this edition, we can benefit from autarch reserve manipulation and we can keep more than 50% of our army in reserve. Since we can get in battle brother transports I wonder if battle brother allies will be allowed through the portal come the FAQ? I'd love to send an avatar out of a portal along with the rest of my pointy eared Mongol horde! Blood Angels Vanguard Veterans with Jump Packs can still assault after Deep Strike. The FAQ never changed the special rule. For the love of all things dark and gruesome, will you all stop complaining about a flamer hit? It has an 8" range!! Why did you come within 8" of something that can kill you without killing it first??? Are you not Dark Eldar? MY OTHER ARMY IS TYRANIDS. Want to talk about the shaft? Let's play that game. Psy Phase moving to less powers cast per turn only helps us. If we ally in a 'Seer, he'll still be casting his powers (and get a bonus if you stick to one tree). Speaking of, you can toss him in with a unit, finally, and cast something prior to charging. Want re-rolls with your Archon? Cool, take a 'Seer with Prescience. Done. Divination is still powerful, if more balanced by WC2 powers. Snap shots after Jink? So now our bikes get a 3+ even without flat out? Cool. Oh, we have to snap fire? Cute, I was going to blade vane anyway. I hear Supersonic no longer disallows Hover Mode. If this is true, this is HUGE for us. Supersonic was a terrible rule to have. Now it's (if as I said) only a plus. This will mean I can take a full HS of flyers seriously, instead of in games where I just want to be able to shout "Eldar Air Superiority!!!" every turn. Defensive grenades. I took PGL's on Wyches for the stealth bonus. Now we can blind instead? Meh, probably won't pay the points for it, but whatevs. Assault is still pretty bunk, it's haywire wyches or bust. It's still a shooting game, and we're still really good at that. Plus, we're due for an update in a handful of months. I'd love to see Mandrakes become decent, because I just think they're fun. Or assault grenades on Incubi, then I'd laugh so hard it comes out my ears. I don't think much will change about the way I build/play DE, except that I'll be happier with the Flyer I typically take. 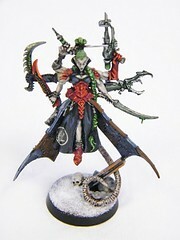 I wasn't aware Dark Eldar had the ability to intercept deep striking units. Which unit was that again? My memory is kind of hazy. I hear Supersonic no longer disallows Hover Mode. If this is true, this is HUGE for us. Supersonic was a terrible rule to have. Now it's (if as I said) only a plus. I hadn't heard about this, and my local gamestore didn't get any rulebooks in. At all. So I haven't had a chance to look at it, but I'll be damned, I'd really like this. Firstly, i do not think that the template thing will be huge. Sure it is a nerf, but it does not feel as the end of the world. Secondly: Wording on super sonic has changed, the last part where it disallows hover has been removed. Has anyone seen anything on characters and precision shots? It seems like it has been removed. Torrent flamers have 12" plus the template. Played a game against a Khorne/Tzeentch Daemon army, and the two flamer chariots had killed 5/7 Wyches with FNP before they could get out of their Raider, but the Wyches were taking their time getting to where I wanted them. So it's not super bad, just fairly unpleasant. Its a USR now (page 169) clarifying it as a special rule in its own right and if someone has the precision shot special rule without any clarifying dice roll (such as it occurs on a 5+ or on all shots) then it just occurs on a 6. That helps with all the Astra militarum orders argument.. The flamer hit on a transport doesn't bother me hugely -in general-. However, there are two things that are just utterly atrocious for us... Drop Pod Frag Cannon Furioso Dreads, and Heldrakes. Just pray your opponent rolls low on the number of hits. If you see a fragioso, cry. It does seem to be absent from the book. Maybe an FAQ to state all independent characters have it at some point. Well i guess it makes the Hexrifle a bit more worth it, since we can't snipe with other weapons anymore. Also, AM has wargear that provides Precision shots for one of their commanders. Maybe GW thought precision shots was a bit to much and nerfed it?